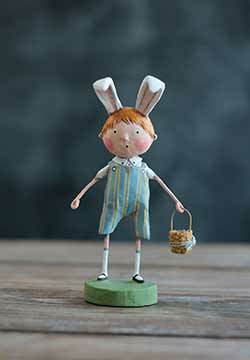 This little boy is ready for spring, with his bunny ears and little basket! He wears a pair of blue striped overalls and white shirt. 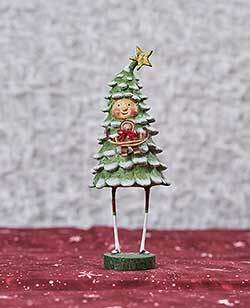 This adorable little boy is dressed up as a snowy pine tree, and hugs a tiny gingerbread man! 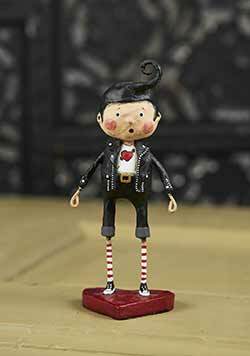 We love the star on his head and his little saddle shoes. 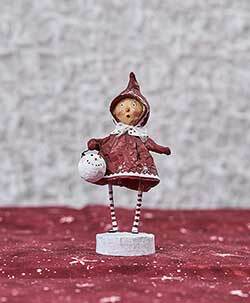 Tiny Brenna is ready for winter in a red and white hooded outfit, and snowman bucket! Bunniella a ruffled skirt and collar, with a pale pink bodice and gold polka dots. 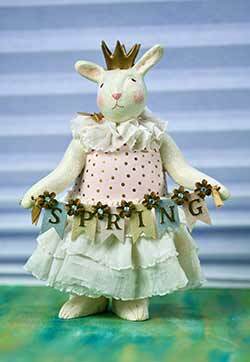 She holds a banner in pastel colors spelling out "spring." 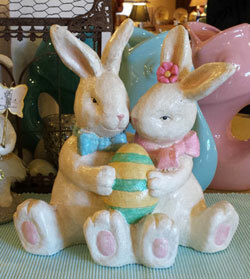 Bunny Cuddles, an M Collection design for ESC and Company. 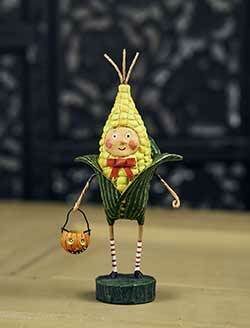 Stands 10 inches tall. 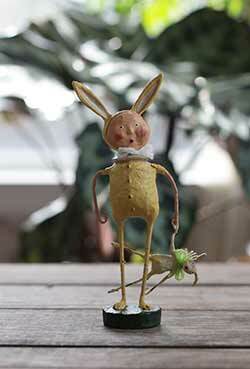 Made of paper pulp. 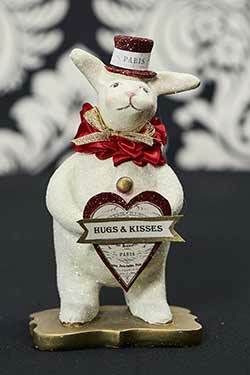 Bunny Love wears a red ribbon collar and a red glittered top hat accented with a "Paris" label. 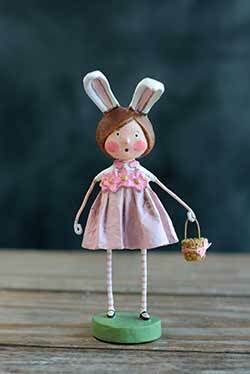 This little girl is ready for spring, with her bunny ears and basket! She wears pink dress accented with flowers. This sweet little bunny kiddo wears a bunny suit, and carries a bow-tied baby bunny. This is for the Yellow Bunnyskins. Buttercup a ruffled skirt and collar, with a ivory bodice and gold polka dots. 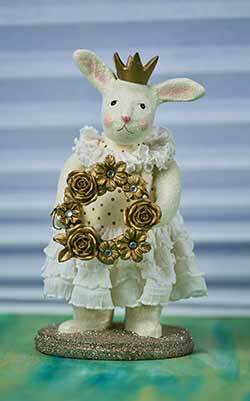 She holds a wreath of golden flowers, and she wears a gold crown. Cadbury a ruffled collar, and gold striped hat. 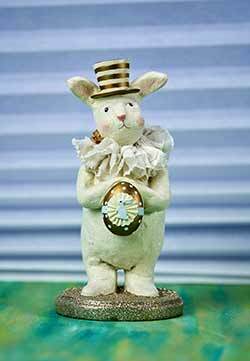 He holds a golden egg accented with polka dtos and a tiny bunny. 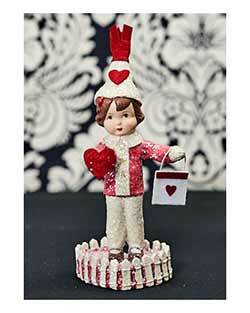 Reminiscent of a vintage postcard image, Carden Heart wears a glitter dusted red and white outfit, holds a heart, and a heart-accented treat bag. 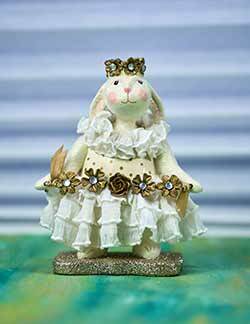 A regal, queenly lady, Chantilly wears a antique white ruffled gown and glittered crown. 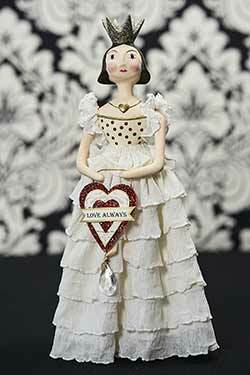 Chiffon wears a ruffled skirt and collar, with an ivory bodice and gold polka dots. She wears a banner that reads "springtime dreams." This sweet kiddo is ready to spread some winter cheer, in his snowman outfit! 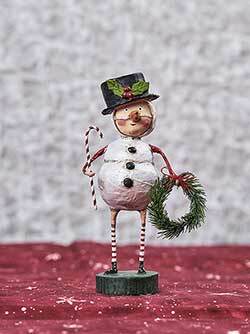 Complete with carrot nose strapped to his face, and a holly accented black top hat! 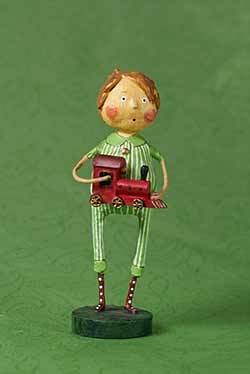 Choo Choo wears green striped jammies and holds a treasured red engine! 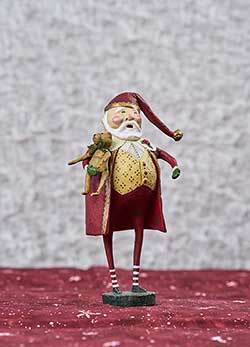 This Santa wears a wonderful old-fashioned outfit, and holds a darling little teddy bear. This sweet boy angel has a Santa Claus puppet! 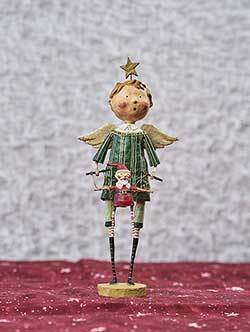 He wears pajamas in shades of green, and has a star halo and angel wings. Cruella Witch, by ESC Trading Company. Cruella has soft gray hair, and a lace-embossed dress. 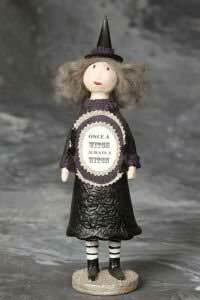 Her paper sign reads: Once a witch, always a witch! A Heather Myers design. 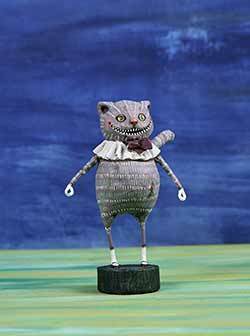 Stands 12 inches tall. Paper pulp / plaster. A 2012 design. 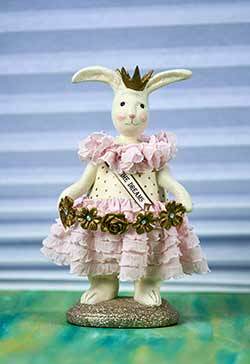 Cupcake wears a pastel blue ribbon collar and skirt, accented with gold polka dots and flowers; her paper banner reads "hello spring." 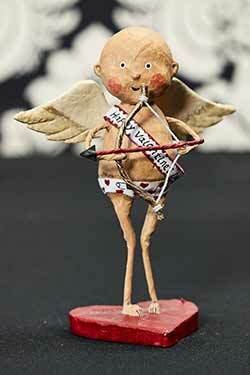 Sweet cupid wears a heart-studded diaper, rosy red cheeks, and holds a bow and arrow! 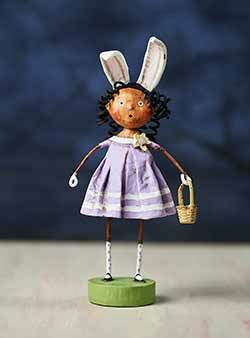 This little girl is ready for spring, with her bunny ears and basket! She wears a lilac and white dress accented with a flower. Daisy a ruffled skirt and collar, with a ivory bodice and gold polka dots. She holds a garland of golden flowers, and she wears a gold crown. 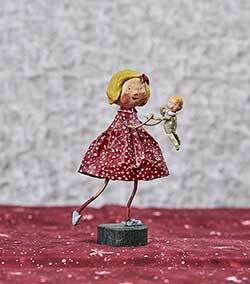 Wearing a red polka dot dress, this whimsical girl dances with a little baby dressed in a lime green polka dot outfit. We love her tiny grey bunny slippers! 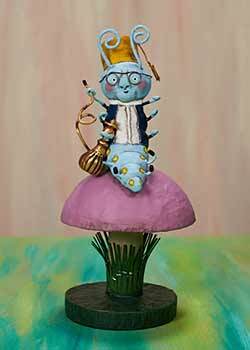 Dapper Dan the Rocket Man, a Lori Mitchell design for ESC and Company. 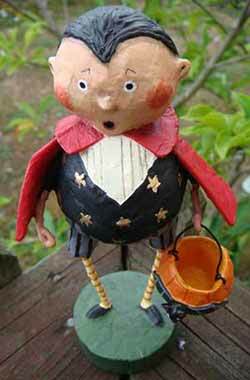 Go for a ride with Dapper Dan, a charming addition to your patriotic display! 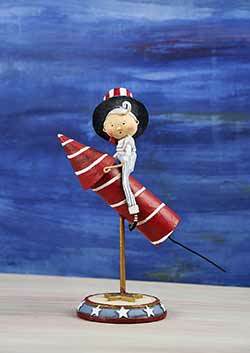 He sports a festive red white and blue suit and Uncle Sam-style top hat, and rides a red and white striped rocket! 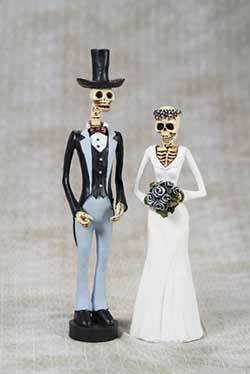 Perfect for vintage style Day of the Dead or Halloween decor, this skeleton bride and groom are ready for their spooky wedding day! 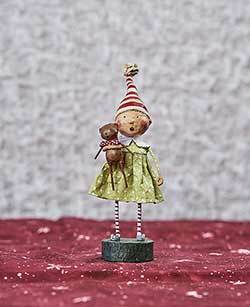 This little girl wears a red and white striped cap, green dress, and tiny little mouse slippers. 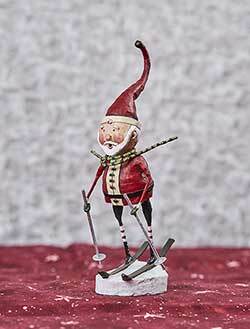 Santa is having some wintery fun, skiing down a hill! 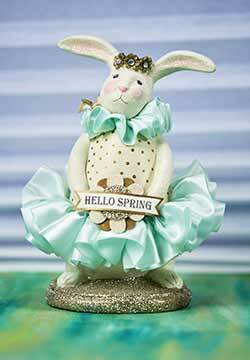 This little one is ready for spring, with her bunny ears and Easter egg outfit - he holds a tiny basket with a single egg inside! Eggland's Best, a Lori Mitchell design for ESC and Company. 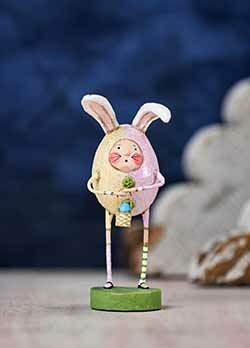 These egg kiddos have egg shaped bodies, pink bows, and hold Easter baskets. 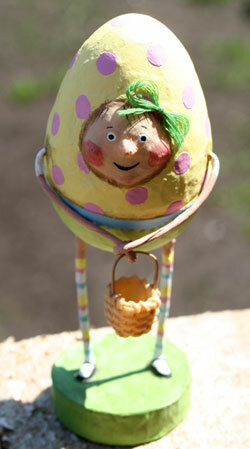 Part of a grouping of two, this is for the YELLOW girl egg. 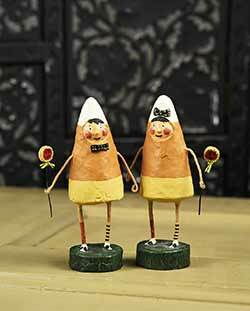 Cast from Lori's original sculpted artwork, these figurines feature detailed carving, shaping, and painting. 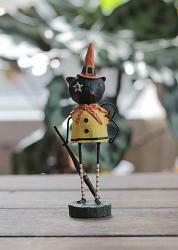 Stands 6 inches tall. Made of resin.